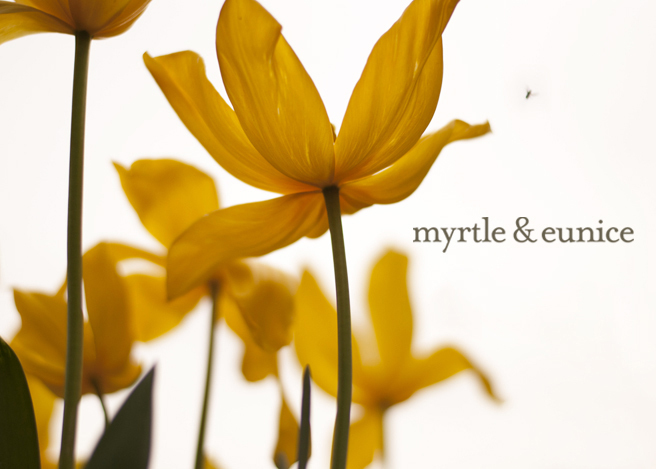 Myrtle & Eunice: Giveaway FRENZY! 1. Comment here for your chance to win my giveaway Chickummyjig above. The egg is optional. 2. Pop on over here where you can find out more about SEWN, and enter their giveaway. 3. Join in the Blog Launch Party here, or check out those already with a glass of champagne in hand here. Enjoy some blog visiting and leave a comment to enter each giveaway. Important! Entries close June 8 with winners announced June 9. For all those Anonymous commenters please leave an email address or contact me, so I can avoid magnifying glass-type dissection of writing styles in an attempt to determine who you are. Your chickie is so adorable! I have a little girl who would love her... Thanks so much! Your chicken makes me smile every time I see one! Love that guy. Thanks for letting him come live with one of us. How adorable! Please enter me! THanks! Poor old chicken ...... it's all got too much for her . I sympathise . Perhaps we both need something to eat . well, anyone who wins this give a way: enjoy it as we would. Oh My! He is super duper cute!! Lurking (while crafty) is NOT bloggy. I think the chicken looks Dutch, too. That little chicken is gorgeous! Too hard to resist, count me in! Tania! Did someone say "win that chicken that cracks you up every time you look at it?" You've got me de-lurking. Awesome giveaway and thank for the info a SEWN, very cool! Thanks! Count me in for this too - and I've just joined you as a follower in return! PS: word verification is "artister", I think that's just about my favourite one EVER. Poppe in via Loz and Dinny who has recently inpsired me to enter more competitions! Have visited before but must delurk more often! Love living in these creative bloggy times! I love the colours in this chickummyjig - and where can I get me some stripey stockings like those ones?? As my daughter would say " 'Eeeeeello Chcken!" I think I would like the Chicken, just the chicken!! My 3 year old would LOVE him! Thanks for the wonderful giveaway...I just may have to download that Chicken Pattern - gorgeous! Just found your blog - love it. Love the chicken. Your chickummyjig pattern is brilliant it just makes me smile everytime I see the original chickummyjig!! But this one...!!!! The colours!!! Its just beautiful...thank you for the giveaway!! Yep I'd love a chickummyjig. 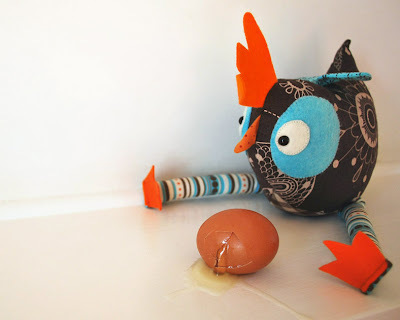 Is Chickummyjig guilty or sad over that broken egg...???!!!! So cute! Thanks for hosting a giveaway! hi I'm delurking juts to tell you how gorgeous your Chickie is :D Yes, I admit it, I'm a Chickaholic!! Fell in love with your little chicky on The Crafty Crow....she makes me giggle!! Love your site !!!! Hi I just checked out your blog for the first time from a link at Rummage. I need to tell you how ADORABLE chickummyjig is awwwww! Off to check out Sewn in a jiffy... right after I have a bit more of a look around on yours first! Hi - Love the little Chickummyjig. Even the name is creative. :-) Pls enter me if you don't mind shipping to the U.S.
the chickummyjig is so cute.. and would love to win.. thank you for your inspiring blog.. Cute Chicky!!! i love the egg, although i don't think it would mail well! Super sweet! Thanks for the giveaway. I'd love the cute chick! what a cute cute chick is it. it will be a great addition to my country kitchen!!! so fun!!!! Oh, do I have a whole list of kids who would love this little chick. Thank you for the chance to win it. I made one of these little guys for my son, we just adore him (the chick and my son!) I love the color combo-sweet! I would love to win that happy little chanticleer! Looking forward to traveling through all the "Sewn" blogs. Thanks for the giveaway! ooh, he's adorable! I'd love a chance to win! Oh! That chicken is just too cute! Definitely have room for it in my hen house! Thanks for the give-away and glad I found your blog! Cute chick! Excited about SEWN, off to check it out thusfar. So happy I found your blog. I've loved looking around and this giveaway is awesome! Chicky is too cute for words. Thanks so much. Love the chick. He would come to a good home! Your blog is fun. Oh yes I want that chickie love! I just painted my sewing room that shade of blue and haven't put everything back in yet, but am looking for things I love to decorate the space. You can keep the egg, we get six a day here...I'm all egged up!!!! Love this giveaway prize. Saw you on WHipup. . .going to do some blog discovering .. thanks for helping me get hooked in!! So cute! I've joined up with Sewn, and can't wait to see how it all eventuates! So very cute....I'm looking forard to seeing what sewn becomes! Hi! Thanks for the giveaway! Count me in! All very exciting and what a cute chicky!! She would look great at my house. I love your writing style! Also, what a cute little softie! I have to have it! Me,me, me! He's adorable! But hold the egg, please. That is a really cute chick. I hope he'll find a good home. I have a very soft spot in my heart for chickens - yours is so darn cute I love it! Thanks for being so generous! How darling!! I love your creations and think this little chicken needs to come home to roost with me. Please enter me in your drawing and thank you. the chicken is adorable! very cute and creative photo. Here chook chook chook chook, here chook,chook chook.....pick me, pick me! I think your chick is amazingly cute & would love to give him a new home. I have just stumbled into a treasure chest of crafters... and what's even better is they are all giving stuff away!! Love your blog!! I love your blog. My favorite part about these giveaways is the chance to see so many cool blogs. Thanks for such an adorable giveaway! love it! What a cute giveaway! By the way, the belly button casting was such a hoot to read! HI-ya just found your blog through dear fii. I seriously love his name Chickummyjig so cooll. Super cute!! She would be so cute sitting on the shelf in my kitchen! Too cute for words, what a wonderful giveaway. Great chicken!! Love the photo with the cracked egg. I LOVE your chicken! I would love to have real live laying birds, but would be most happy with this friend from Australia! Wow is she cute!! Would love to have her sitting in my kitchen! What a cute chook! I hope that he's not too traumatised after the broken egg incident!!!! She is adorable - I'm sorry about her poor egg! wow how cute is this! Feel free to visit my blog and see what I'm giving away. Your Chickummyjig is just wonderful, I think I would be in trouble with my daughters if I didn't enter! Great blog and great giveaway! Got to love a chicken looking for a new home - he would be welcome at ours anytime! Wow - a party and presents. I would love to take your little chicken home with me. He would be loved and we would feed him everyday!!!!. Thanks for your great giveaways. Who could possibly resist a chicken as adorable as this... it's the eyes, no it's that cute little spotty beak, nope, I know, it's those stripey chicken legs awwwww.... cluck cluck! What a gorgeous chicky. Thanks for the chance to win ... he/she would be very welcome at out place. It is so much fun discovering lots of 'new to me' blogs in the SEWN giveaways. What a unique name for a very cute chicken. I hope it likes to travel! I'll pass on the egg, but that chick is a doll!!!!! How cute is that? What a great giveaway. Thanks. So cute...That picture is priceless! Aw, I am completely head over heels with your Chickummyjig. I'd be so tickled if I were to win. Thanks for holding a sweet giveaway. How fun! Please sign me up. so darling!! thanks for the chance-keeping my fingers and toes crossed to win! Just the chickie, please! how adorable! Thanks for the giveaway! nice prize! count me in! Oh how cute! I'm in! What cute softtoy! Please put me in the draw. What a character he is! i just love this Chickummyjig. it is just too darn cute. i need to win this or i will have to make one. makes me happy. I would love to be the new family for your chick. I'm sure she would love to come to America. Thanks for the chance to win her. your chick is adorable! i love his big blue eyes! Thanks for making him for me, I've already told you he'll have a good home here, but I understand you just want to make the others feel that they have a chance. Seriously...he is super-duper and I would love to win him! So adorable! Would love to have him live at my house. He is so cute! I NEED him! What a great giveaway! He is SOOOOO CUTE! Enter me please! In just under the wire, I hope! Phew indeed! I don't know how you do it! I keep having to sit down between putting two cups in the cupboard! You are inspiring though so well done. That cheeky chick would be right at home with my three cheeky chicks! Lovely giveaway. How did I miss this one until now? I want Chickummyjig to come and live at my house! I just have two words...too cute! i would love to bring home that cute chook with me! :) have a great week tania! He is too cute! But you can keep the egg, thanks. I love the little chicken! Please enter me in your giveaway. I would love to give chickummyjig a home! I think he would be very happy in Kentucky with my menagerie of three boys, three dogs, my husband and me! If we overwhelm him too much, he could always hide out in my huge stash of fabric where, I bet, he would feel right at home! Your blog is wonderful and you make beautiful things! Am I too late? I have been away for the long weekend and are only playing catchup with my blogs now!